Adalbert Meingast (February 9, 1845 – March 24, 1927) was an Austrian philosopher, classical scholar, poet, and esotericist. 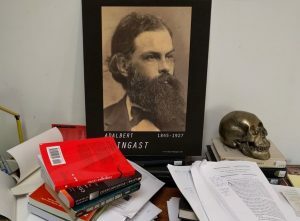 In recent years, there has been a resurgence of interest in Meingast scholarship among Anglo-American researchers of the 19th and 20th centuries. In 2014, together with Kristin Primus (Berkeley), I have recruited a cohort of scholars to translate, catalogue, and publicize the work of Meingast. Fragments of Meingast’s manuscripts are currently being uncovered by members of our team.